This image of a male white-necked jacobin (Florisuga mellivora mellivora) was taken while on a Tropical Audubon Society birding trip to Trinidad and Tobago led by Brian Rapoza. 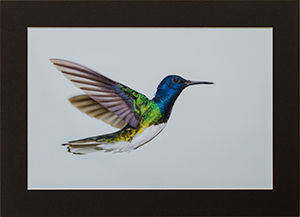 These hummingbirds can be found from southern Mexico south to eastern Peru and northern Brazil. 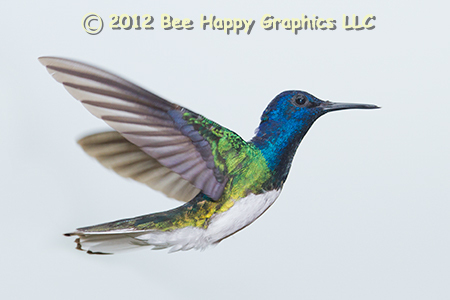 A sub-species of larger hummingbirds (F. m. flabellifera) is found on Tobago. White-necked jacobins live high up in the canopy of humid forests (unless attracted by feeders, like this one was) from sea level up to around 3,000 feet elevation. Males can be up to 4¾" long and weigh over ¼ ounce. Females weigh up to 25% less. Photographic details: Canon EOS 7D camera w/ EF 100-400mm f/4.5-5.6L IS USM lens set at 275mm. Flash was used off camera (as described in the last paragraph of this blog post). Camera was on f/5.6 for 1/2000 sec at ISO 1000. Fine Art Paper 31/2" x 5" 15" x 21"
Canvas N/A 19" x 271/2"